Promo period is from January 28, 2019 to February 28, 2019. Lunch buffet is applicable only on Saturdays and Sundays. Dinner buffet is applicable on weekdays and weekends. Requests for redemption of Miles must be filed with Mabuhay Miles Service Center (MMSC). Members may visit Mabuhay Miles Service Center or call the hotline at (02) 855-8888. A confirmation message (via email) shall be sent by Mabuhay Miles to members within 24 hours after redemption. Reservations are required 48 hours prior to dining. 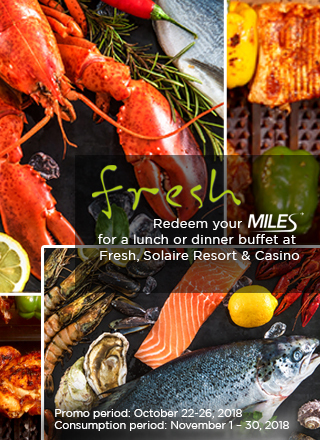 Starting January 31, 2019, members may call Fresh at (02) 888-8888 to reserve. If voucher will be used by another person other than the member, letter of authorization with signature from the member, printed copy of the email/CMS confirmation and copy of valid government IDs or passport of the member and authorized person to redeem are required. This promotion cannot be availed in conjunction with other promotions or discounts schemes. Redeemed Miles may no longer be credited back to Member’s account. Additional person/s will be settled/paid by the member or beneficiary at actual cost of the buffet package. Per DTI-FTEB Permit Number 0972, Series of 2019.